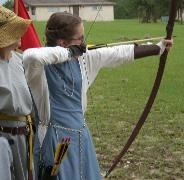 Bio: Originally starting the SCA in SWFL but has since then moved and now calls the Kingdom of Altantia home. She is a 12th century French/Italian woman and daughter of a well to-do merchant. She currently resides in Thessalonike with her sister helping with the family merchanting business but she finds time copying manuscripts as well as taking commissions for illuminations, books and other artwork. Interests: Line drawings, calligraphy, illumination, gilding and bookbinding.